Featured in documents dating from as early as the ninth century, the church of San Maurizio al Monastero Maggiore in Milan is one of the oldest and remarkable testaments to the evolving art and architecture of the city. The numerous cycles of frescoes that adorn the interiors of this former Benedictine convent, suppressed in 1798, afford a cogent testimony to the development of painting in sixteenth-century Lombardy. This book offers the first detailed photographic study of one of the Lombard Renaissance's most complex and articulated monuments, gradually completed in the course of nearly a century. 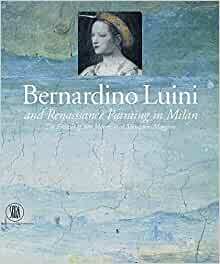 Given the complexity of the subject treated, the book has been divided into four large sections, each one accompanied by a plan of the church that enables the reader to follow the monument's unfolding cycles with each successive phase of additions, including the renowned works of Bernardino Luini, one of the greatest painters of Renaissance Lombardy. The appendices include a bibliography, an index, and the complete records of documents relating to the frescoes and furnishings of the church.